The Plumber Shop/Renewal Agency, which interferes with the development of your opponent's cities. The Flea Market/Recycling Bin, which are used to give you an extra burst of money when needed. 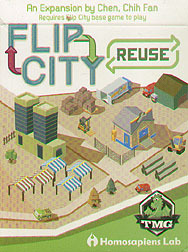 Requires Flip City base game to play.